Silence Yourself is gripping and remarkably consistent in its drama and power. It’s loud and abrasive and angry. Many songs are damn catchy, and every element is purposeful, even the piercing feedback in “Waiting for a Sign” and the bleating, atonal bass clarinet that fades out to close the album. The ambition and skill level apparent on Silence Yourself (and therefore in Savages’ live shows, presumably) exceed that of the average punk band, but the band’s energy and attitude, and frequently their tempo and volume, are pure punk. The Savages formula for capturing and holding a live audience’s attention thus seems to emphasize tight songwriting, technical aptitude, punk energy, and intense urgency. Like I said earlier, I’d imagine that formula is a successful one. In terms of Savages’ sound, the common comparisons to Siouxsie and the Banshees are somewhat useful, but I’d argue that on some level this comparison is rooted mostly in observing surface-level similarities between the female voices that front both bands. The Siouxsie-Savages comparisons betray not only certain assumptions about the inherent sameness of rock bands with strong female presences, but also a basic lack of familiarity with Savages’ more relevant antecedents. Rather than the less desperate, less heavy, often more synthetic Banshees sound, Savages primarily reminds me of two of the post-punk era’s loudest and most dramatic rock bands. I get the same vibe from Savages, musically and at times even lyrically, as I get from The Sound and The Wipers. True students of the era will know that these are lofty comparisons to put upon Savages, but I believe Silence Yourself is good enough to stand up to these two bands’ immortal, genre-defining albums of the early 80s. I’m not going to do a point-by-point, song-by-song comparison of Silence Yourself with the Sound’s Jeopardy (1980) and From the Lion’s Mouth (1981; one of my all-time favorite albums) and the Wipers’ Is This Real? (1979), Youth in America (1981), and Over the Edge (1983). Neither of the legendary, though somewhat unsung, older bands is a perfectly apt touchstone for Savages (just as Siouxsie Sioux is not), and frequently Silence Yourself evokes the tone and mood, rather than specific sonic elements, of the albums mentioned above. 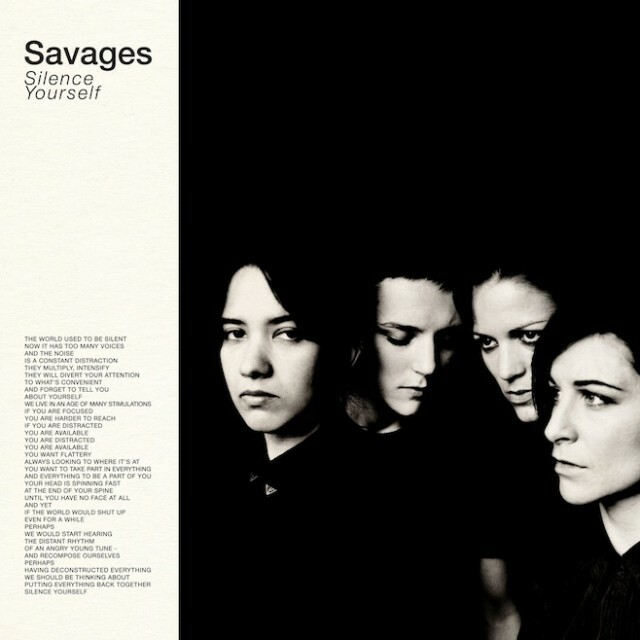 At other times Savages sounds like some heaven-sent alchemical mixture of the Sound and the Wipers, with the former’s drama and dynamics matched with the latter’s tempo, volume, and heaviness. I’ll let you make up your own mind, of course, but as a little experiment, try a 3-song playlist of the Wipers’ “Over the Edge,” the Sound’s “Skeletons,” and Savages’ “City’s Full,” though just about any track from Silence Yourself will follow nicely here. Note that in this live version of “City’s Full,” Savages is just as heavy as the mighty Wipers and, toward the end, as capable of compelling dynamic shifts and atmospherics as what the Sound displays on “Skeletons” (and in nearly every song on the absolutely immortal From the Lion’s Mouth). Above all, I’d argue that the best way to appreciate the significance of Silence Yourself is to put away all the analytical stuff, listen to the album with the volume turned up, and just feel the thing’s power. Simply, this is thrilling rock music. Count me among those who believe that Savages is, thus far, keeping the promises of its quasi-mission statement, which reads in part, “SAVAGES’ INTENTION IS TO CREATE A SOUND, INDESTRUCTIBLE, MUSICALLY SOLID, WRITTEN FOR THE STAGE AND DESIGNED WITH ENOUGH NUANCES TO PROVIDE A WIDE RANGE OF EMOTIONS. …SAVAGES’ SONGS AIM TO REMIND US THAT HUMAN BEINGS HAVEN’T EVOLVED SO MUCH, THAT MUSIC CAN STILL BE STRAIGHT TO THE POINT, EFFICIENT AND EXCITING.” As you can see from this statement, Savages is an “all-caps” sort of band that takes itself and its work quite seriously, and if you’ve been wanting a new, young, loud, brash, talented, ambitious rock band to get excited about, then I’d say these four women and their lofty debut album just might be what you’ve been waiting for.